But....you can save $11,000 on it now! How Mustachian is that! My used bike rack attaches to the back of my car...but now I feel inadequate. Surely a truck would be a more efficient use of space to haul the bike around. I mean...11k off, can't beat that. The discount is more than a used car! Off to the dealer now! Yesterday my dad insisted on driving me home from his place, instead of my cycling back. We had just finished a 13 km walk/hike. He's my dad, and insisted. He has a 2 month new Ford Truck. The challenge is figuring out to to get the bike in there so that it does not scratch the paint, nor damage my deraileurs / parts for the short 10km drive back. It seemed incredibly more awkard than riding the bike home. Is there a big overlap between truck buyers and cyclists? I mean, I've only got my experience cycling around people who drive pickup trucks to go by . . . but based on their actions my assumption has always been that the two circles rarely converge. Lots of people buy trucks to haul their weekend toys around here, and a very popular past time is mountain biking. They put those large padded drapes over the tailgate and haul 6 bikes at a time. Typically they go for the day to a hill about 1 hour away, and switch driver support, so the cyclists don't need to ride up the mountain each time. Not so much around here. I only know five people with pickups who show up at our rides, but two of those guys are in construction and do use the trucks for work. The other three just like trucks. Two of them have built bike racks in their truck beds from 2x4s, with mounting points for the front forks. They can carry four bikes, which can come in handy at times. I used to ride in a group with a guy who hauled his road bike on the back of an H2. It was rather sad to watch. Unsurprisingly, he was not well liked. There is a truck in our parking lot with a short bed, a cover over the bed, then roof rails and a bike rack on top of the bed cover. I'm not sure what to think of all that, seems overly complicated but maybe there's a reason. Whatever it is I would have to imagine there's a better solution out there somewhere. That ad did seem kind of silly. Found an example of the tonneau cover + roof rack I mentioned upthread. Did anyone ask themselves halfway through setting up this rig, "Should I really be using a truck for this?" I’m my bike club of 100+ members, I can only think of a couple who have a pickup. It’s mostly people with Honda and Toyota stuff. Many small SUVs. Almost no one uses a rack. Bike goes inside car. 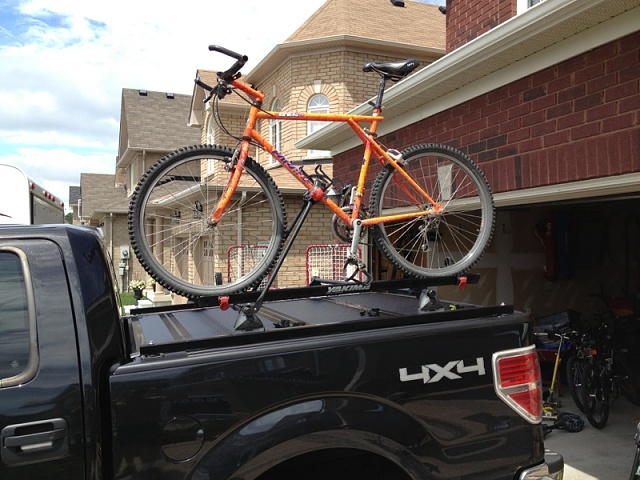 Only a matter of time before you drive into the garage with a roof rack. Will the the truck even fit in the garage without scraping the door? The other thing I wanted to add is the guy in the commercial is clearly not a biker, or at least an experienced one. He is wildly moving every part of his body except his legs. At least get a model who knows what they are doing. Total fail all the way around, GMC. I do something similar on a little $500 utility trailer that anything bigger than a push mower can tow. Hand positioning also gives it away... I don't know too many cyclists who ride uphill in the drops.